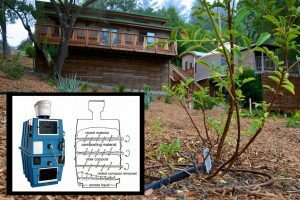 Intentional communities can be the perfect testing ground for new sustainability practices – whether it’s an innovative greywater system or an aquaponics garden. At my community in Portland, we use our own composting toilet system, specifically intended to be safe and smell-free in a busy urban environment. Instead of flushing clean water down the train dozens of times each day, we use a system of buckets and storage bins to collect waste and re-use it as fertilizer for our garden. By mixing in woodchips – and the occasional bucket of coffee chaff – we keep pests from accessing the pile and the neighbors from complaining. They hope that their research can make it easier – and legal – for hotels, apartment complexes, and more, to choose composting toilets over water-guzzling ones. Plus, the toilet is designed to look just like your average American toilet, so it won’t look out of place in your bathroom when your friends and family visit. Regular toilets waste up to 20 gallons of water per person per day. In a time of increasing water scarcity, let’s put this outdated invention into the compost heap where it belongs and create a toilet that works for the modern era. 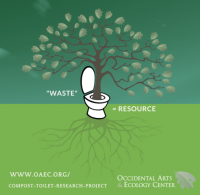 Have you considered installing a composting toilet or simply want to support the cause? Check out the video below to learn more about the project and support it with a Kickstarter pledge here! Supporters can choose from a set of educational posters, a tour of the completed facilities at OAEC, and more. Learn more about the Occidental Arts and Ecology Center at OAEC.org. ← Are you feeling connected?